What Is The Osaki OS Pro Maxim? 10 Cool Features Of The Osaki OS Pro Maxim! #2 Comes With A Touch Screen Tablet! Who Should Buy The Osaki OS Pro Maxim Massage Chair? How To Find The Best Deal! What Else Do You Need To Know/Consider Before Buying? That’s My Take, What’s Yours!? 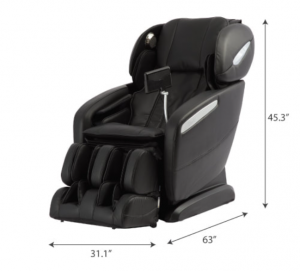 The OS Pro Maxim is a technologically advanced massage chair that features a state of the art back roller system. In addition to L-Track rollers, the OS Pro Maxim boasts a plethora of other features. 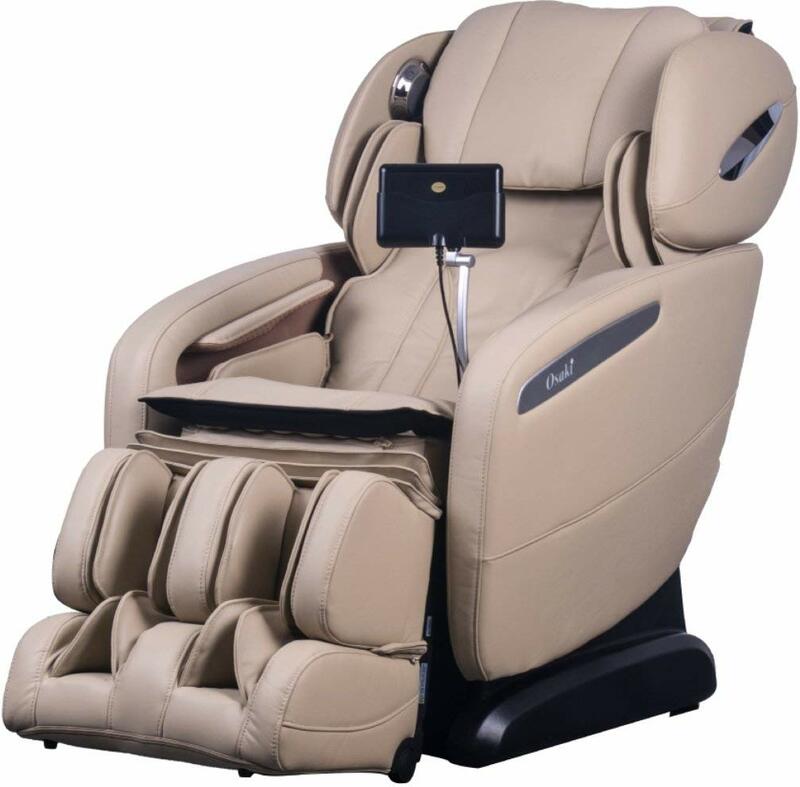 The Osaki OS Pro Maxim is a high end massage chair capable of delivering medium to strong massage! Osaki only recently released this unit, so you can be sure it has all their latest technology. Let’s take a closer look at what it can do! There’s a lot of cool things this chair can do, but I’m only gonna be focusing on the 10 key things. One thing you immediately notice with these higher end chairs is that you get a much more improved roller system in comparison to units that cost about $1500-2500. In my earlier reviews of the OS 4000T & OS 1000, I spoke about how S-Track rollers are awesome because they trace or follow the spine’s natural “S” curvature. But what in the world is L-Track? A simple way to think about L-Track is that it’s a much longer, extended version of S-Track. L-Track rolls from the neck all the way right down to the glutes and hamstring, whereas S-Track rolls from the neck to the lower back. That being said, L-Track is S-Track but with a much larger track span! L-Track Rollers Travel All The Way Down To The Hamstrings! And what is the roller track span you ask? 47 inches! That means the rollers will track a total of 47 inches from neck to hamstring. Pretty incredible considering most massage chairs can only track to about 31 inches! The remote control to operate this chair is basically a touch screen tablet. I don’t know about you, but I think that’s pretty neat! Osaki has supposedly revamped the user interface so it’s now easier to alter airbag intensity, roller speed, and select various programs. Everything is basically a lot more visual now than previously. Also, the interface tells you exactly what the chair is doing in live time. Is this one of the main reasons I would buy the OS Pro Maxim? Probably not, but it’s definitely nice to have! I’ve always found Osaki remote controls to be simple and well laid out, so there wasn’t ever an issue to begin with. The Osaki OS Pro Maxim has the ability to massage in zero gravity. What is the zero gravity position anyways? It’s a seating position that’s been extensively researched by NASA. Long story short, it’s the position astronauts sit in during their flight to outer space! Less Stress To The Spine—You face the least possible stress on your spine in a zero gravity position. As a result, massage is much more effective and comfortable! Improved Blood Flow—Blood circulation is improved and enhanced when in a zero gravity position. Improved blood flow means your muscles are able to access oxygen and nutrients much quicker than usual. What Zero Gravity Looks Like! Fun fact: did you know car manufacturers are starting to introduce zero gravity car seats? Don’t believe me? Check out what Nissan has to say! The Osaki OS Pro Maxim features 2 rows of spinning foot rollers that perform a kneading style massage on the soles of the feet. When considering a massage chair, always look at the bigger picture! What I mean by this is think about getting a chair that’s an “all rounder”, not something that’s just great at back massage. When I bought my chair, I didn’t care too much about foot rollers. As much as I hate to admit, I now regret that decision. Don’t make the same mistake I did! Most massage chairs require a minimum clearance (2-3 feet usually) behind the backrest to allow for the chair to fully recline. The OS Pro Maxim only requires a mere 6 inches of distance between the backrest and wall! How does this work? As you recline backwards, the chair slides forward! If you’ve ever sat on a Dreamliner plane before, you’ll know exactly what I mean. The seats on those do the exact same thing! This has got to be one of my favorite features of the Osaki OS Pro Maxim massage chair, and that’s because space is a rare commodity in my home! With this feature, I can now install and place the chair in my living room with the rest of my furniture. This isn’t something I can do with other units. OS Pro Maxim comes with built in Bluetooth friendly speakers, so you can listen to your favorite tunes while getting a massage. Bluetooth Friendly Speakers With LED Lighting! What I like to call “bells and whistles”. It’s the sort of feature that makes no difference as far as massage is concerned, but it’s definitely nice to have! Both speakers are surrounded and encased by blue LED lighting. Again, definitely cool and nice to have, but not something I would sweat over! Imagine cycling through 12 programs. You’d need almost 2 weeks to try them all out! With so many different programs, you’re spoilt for choice! But what exactly are these 12 programs anyways? Deep Tissue—Not meant for the faint of heart. Expect some discomfort! Sleeping—Consists of low intensity kneading and tapping. This mode is usually best done at night before going to bed. Wake Up—Opposite from the sleeping mode, and definitely more intense! Stretching—Consists of 4 different stretching actions. This mode is primarily focused on air compression massage. Kidney Vigor—This mode places emphasis on the lower back. The idea is to massage muscle and tissue surrounding the kidneys. Men’s Health—High intense tapping, low intense kneading is all this is. Don’t know why it’s called men’s health to be honest. Older Vitality—As the name suggests, this is the perfect program for seniors. Massage strokes will be mild with low intensity. One of my favorites modes! Spleen Digest—Another mode that focuses on the lower back area. General—Basically a full body massage with all techniques and strokes. I like this mode too! Women’s Beauty—Focused on the lower extremities of the body (hips, thighs and waist). Again, not sure why it’s called women’s beauty! Recovery—Kneading, tapping combo focused on the hips and waist. A good mode to try after strenuous exercise or sport! Healthy Regimen—Similar to “general mode” but with more emphasis on the lower parts of the body. What mode do you think you’d use most? Leave it in the comments! There’s 2 heating pads located on the right and left side of the lower back area. Are heating pads important to have? You bet they are! Heat makes a massage that much more effective by improving circulation and releasing muscular tension. More importantly, it feels great! Swedish, Tapping, Shiatsu, Clapping, and Rolling! You can also set the area of focus, roller speed, airbag intensity and more. Always nice to have the ability to make manual changes even with all the automated programs! The Osaki OS Pro Maxim has quad rollers (4). These quad rollers are integral to the chair. They’re responsible for the kneading, rolling, tapping, and shiatsu strokes. It’s important to take note of this because other models don’t have the same number of rollers. Don’t mean to sound like a broken record, but the rollers really determine how good or bad a chair is! I’ll repeat this in every review post if I have to! Finally A Chair That's Perfect For Larger Body Types! Suggested user height range is 5’1-6’4. That’s basically a foot and 3 inches of variation! Not easy to find peeps. Also it’s one of the few chairs from Osaki that has a suggested user weight of 285 lbs. By the way, this isn’t something that affects me at all. I’m 5′-5 and weight about 120 lbs. I’m just glad to finally see a chair that fits some of the larger body frames out there! And The Best Part...It's Not Even All That Big! What if I told you this is one of Osaki’s smallest unit in terms of height and width, would you believe me? It’s true, i’m not kidding. This unit measures 45” high, 31” wide, and 63” deep when fully upright. Yes, nothing too impressive about the depth, but Osaki have done an awesome job with the height and width. This, coupled with the earlier discussed space saving technology make the OS Pro Maxim a great choice for anyone who’s tight for space! Fewer Airbags That Cover A Larger Surface Area! The OS Pro Maxim comes with a total of 22 airbags; that’s 16 fewer than the cheaper OS 4000T model. At first thought having more airbags may seem like a good thing, but that’s not quite true. More airbags means you need additional valves and larger sized pumps. All this does is hike up power consumption. Osaki have come up with a way to reduce the number of airbags while still maintaining massage surface area. The 22 bags in the OS Pro Maxim are equivalent in terms of covered surface area to a chair with 45 airbags. Impressive! For Those Who Like A Strong Massage! This is one thing you don’t get in Osaki’s cheaper models. Models such as the 4000T and 1000 can only do a “mid strength” massage. However, the OS Pro Maxim can do a “medium to strong” intensity massage. This is especially important for people who suffer from chronic pain who require a strong massage. Now it’s important to understand that strong doesn’t mean deep. This isn’t a chair capable of doing deep tissue massage. The intensity might be close, but definitely not the same as deep tissue. A Good Chair For Seniors! 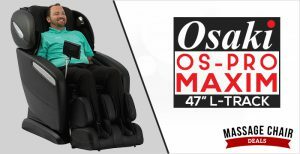 The Osaki OS Pro Maxim is in my opinion an awesome massage chair for seniors. There’s a few reasons I feel this way. One, the touch screen visual interface is foolproof and incredibly easy to use, and two, it features a number of low intense program modes specifically suited for seniors! Even with the reduced airbags, valves, and pumps, the net weight is about 236.5 lbs. That makes it quite a bit heavier than most chairs. Definitely not the biggest of concerns, but worth mentioning. Once you have it setup this is basically a non issue. Really anyone, but if you’re one of the 3 people below, then you should seriously consider this chair! If You’re Looking For More Than Air Compression On The Lower Body—L-Track technology makes it possible for quad rollers to massage right down to the hamstring and glutes. As such, there’s a lot more rolling, tapping, and kneading on the lower extremities compared to other chairs! Seniors—Simply because it’s so darn easy to use! 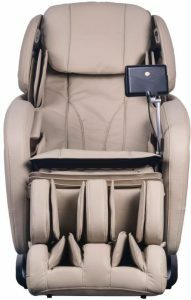 If You’re Able To Afford It!—Make no mistake the OS Pro Maxim is very much a high end massage chair, and its price reflects this. If you’re on a tight budget, this is probably not the chair for you (check out the 1000 if you’re in the market for a lower priced chair). When it comes to big investments such as a massage chair, you need to make sure you find the best possible deal. There’s only one way to find the best deal: do your homework! Get on the internet and start searching. Pick up the phone and call up local massage stores in your area. This is basically what I did when I bought my chair. By now you’ve obviously seen the affiliate links included in this post. Yes they’re affiliate links, and yes should you choose to buy using them, i’ll make a commission. Why am I telling you this? Well for one, as a consumer you deserve to know, and two because i’m not one to hide anything. 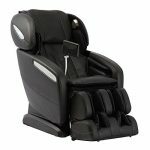 I link to massage chair deals because that’s who I would buy off, and that’s exactly why I recommend them to you guys! They Usually Have The Best Price!—Based on my research, they usually have the best prices, but if they don’t they will price match and potentially beat! I Have Privileges!—Type in MAM5 to get an extra 5% off. Consider it as an appreciation on my part for reading this far! Financing, Shipping And More—They have financing options for anyone who doesn’t wanna pay it all at once. They offer free curbside delivery as well. Amazon—Click here to check latest pricing. In-Store—Consider local massage chair stores in your area. If you’ve decided to buy the Osaki OS Pro Maxim massage chair, you should spend some time thinking about extended warranty. Is it worth spending extra $$$ for an extended warranty? In my opinion, it depends. If the price is $2000 and over, then definitely yes! It doesn’t make sense to spend $150-250 to cover a chair worth $1000-1200. However, it absolutely makes sense to spend this amount for a chair worth $2000 and up! For this chair specifically, I would definitely suggest and recommend the extended warranty. You have the option to go with extended 4 year or 5 year. Pick whatever works for you! Lastly, I strongly recommend you check out some of the product videos before buying. Below is one showing some of the features I’ve talked about (all credit to Massage Chair Deals). I’m a big fan of the Osaki OS Pro Maxim massage chair, i’m not gonna lie. It’s definitely one of my favorite chairs currently on the market. If you consider all it can do, it’s good value for what you pay! Enough what I think, what do you think? Would you consider getting this chair? If you already own it, what are your thoughts? Leave a comment and let us know! Lastly, if you enjoyed reading and got some value out of this post, please consider sharing on the socials. Honestly, that’s the best way you can help support this site. If there’s anything else I can help with, please do not hesitate to drop me a comment or even send me an email (support@massagersandmore.com). I’ll see you in the next one!